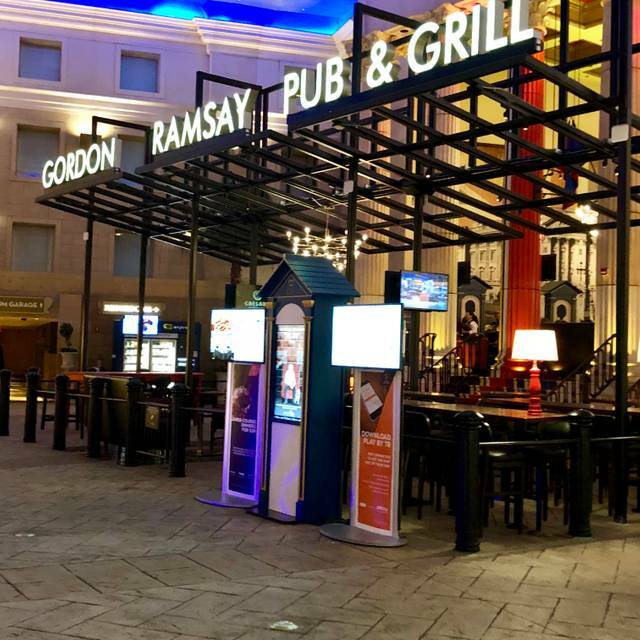 You must make reservations at least 5 minutes in advance of the time at Gordon Ramsay Pub & Grill - Caesars Atlantic City. 25 beers on tap. The space is welcoming, high-energy and comfortable, utilizing distressed woods with references to historic and iconic events throughout the series of dining rooms. The centerpiece of the restaurant features a striking bar with an array of beer taps on display and the backdrop inspired by traditional London red telephone booths. Pop culture relics from both England and the United States fill the walls and serve as a major part of the design. Ketel One Vodka, Pavan Liqueur, Passion Fruit, Lime & Fever-Tree Ginger Beer. After a Few of These, Don't Forget to "Mind the Gap" While Exiting the Tube! Hayman's Old Tom Gin, Dubonnet Rouge, Muddled Strawberries & Amarena Cherry with a Squeeze of Lemon. The Queen Drinks Her Gin & Dubonnet Before Lunch Every Day. Why Shouldn't You? Come and Join Our Barmen & Barmaids for Half-Price Draft Beer & Wine On Tap! Experience The Changing of the Guard Happy Hour 12:00 P.m. – 1:30 P.m. (when open), London Calling Happy Hour 4:00 P.m. – 6:00 P.m., and "Parting Cup" Nightcap 10:00 P.m. - Midnight (when open). The Next Great British Invasion Has Arrived! We had a great time, food was excellent, atmosphere was nice. Our waitress Sandra was excellent, very friendly and courteous. Everything about the dining experience was outstanding. The staff was attentive. Our waitress Taylor was very nice and happy to answer all our questions on the menu and specialty drinks. She definitely knew the menu items well and made recommendations. The food was excellent. Everybody enjoyed their meal and we did a lot of sharing and tasting across the table so everyone could see how good the other dishes were. The short rib was tasty and fork tender. The onion soup was the best I’ve ever had. The fish and chips topped our all time favorite (Disney Epcot’s Rose and Crown take out). Everything from the Beef Wellington to the pub sandwiches were cooked perfectly. Chef Ramsey would be proud. Some of the most amazing food I have ever had. The Beef Wellington was the star of the show. The fish and chips was very disappointing. Fish tasted of grease and oil and nothing else. Other then the fish everything else was 10/10. I really looked forward to going and celebrating my anniversary. I ordered beef wellington, risotto, squash bisque and my other half got the Roasted beet buratta mozzarella salad and the Impossible veggie burger, because he was vegetarian. The guy that greeted us was great, but the server was stuffy and wouldn't check on us if we needed anything. The soup was great. The main entree Beef Wellington was over-cooked (it was a brown center not red) tough salty and soggy puffed pastry sitting in a tiny mashed-potatoes. I so looked forward to trying this and a great fan of Gordon Ramsey and all his shows. I'm not a chef but I am a professional cook as my email is justcookng4u2. However, I didn't finish my entree or risotto and my mate didn't finish his entree & truffle fries. The server boxed our stuff-up and not separately. The Beef wellington was thrown in the box with mash-potato's and the vegetarian fries. 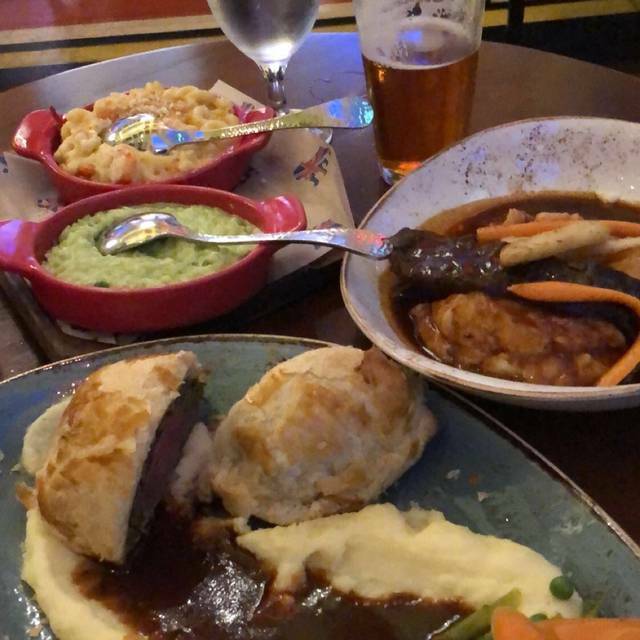 My mate is Vegetarian and was looking forward to his left overs, but unfortunately could not, because the beef wellington and my entree mash potatoes coated his vegetarian burger and fries. You never mix someone else's entree with someone else's. What was worse Vegetarian meal mixed with my beef wellington. The food was very salty and I was afraid to send it back it was not quality as I think it should of been. I really think Mr. Ramsey may need to visit this kitchen or send mystery shoppers to really see whats going on in this establishment both servers and before food goes out to his quality standards again. Had a horrible experience hostess, Courtney was rude and manager, Nick was rude and no help as well. Made a reservation on OpenTable and could not honor my request for booth. 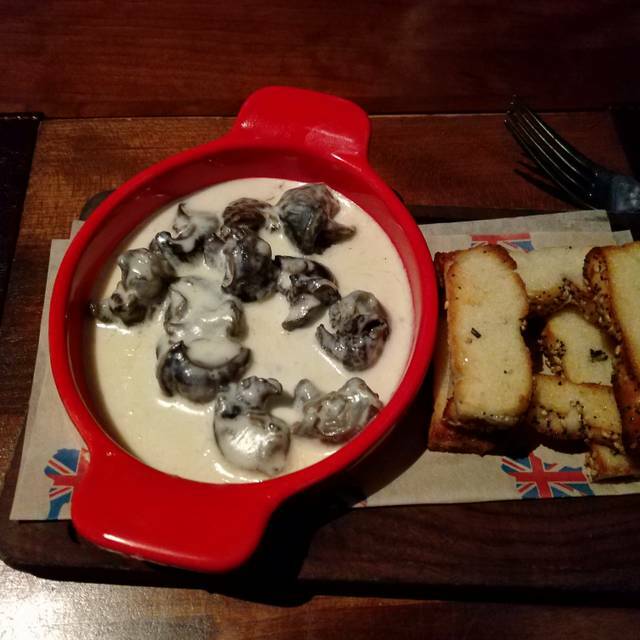 Awesome experience the service, food, well......everything was above and beyond my expectations I had the shepherds pie and it was great..
we LOVE this place, the atmosphere is great but the food is fantastic!!!! A must every time we visit!!!! Amazing experience. Some of the best food in my life!!! Looking forward to visiting again. Gordon Ramsay and his staff did not disappoint. The lamb burger and truffle fries were delicious. The roast beef pretzel sandwich was okay. The onion soup was good. 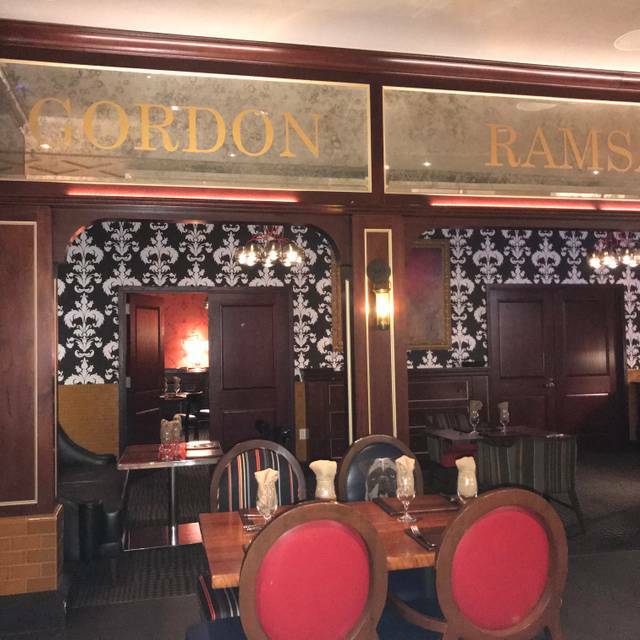 Gordon Ramsey is our place to go for food! The food is delicious. 36 th Anniversary food was wonderful server Taylor was great! The food was amazing! The mixed drinks were a little pricey ($15 for a Long Island) but I expected that. The only problem was the waiter seemed to rush our drinks and orders and we didn’t really have a lot of time to chose what we wanted. One of my friends didn’t even get his drink order in with everyone else because he was in such a hurry. Excellent food! Wait staff extremely friendly, and the ambience great for meeting with friends. Good food and drinks are to be found here. Good Tomahawk Chop and good Beef Wellington, among other treats. 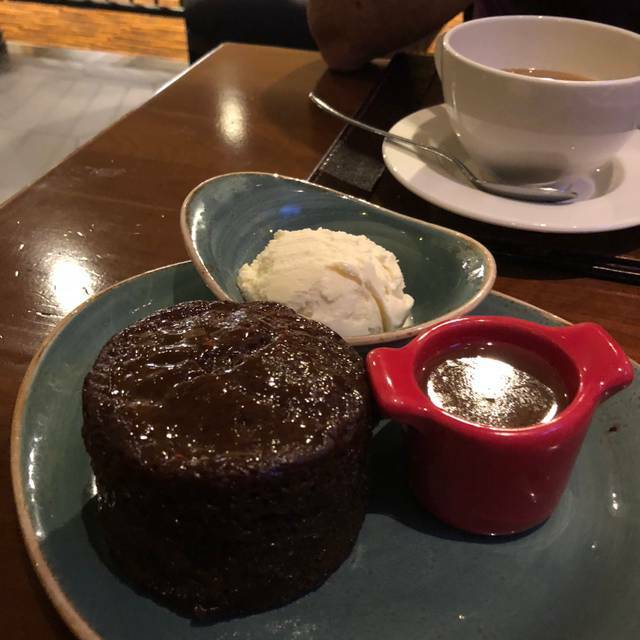 Excellent Sticky Toffee Pudding for dessert . The scallops with grits was wonderful! My husband had the beef Wellington, which he loved! Can't wait to go back! The onion soup and calamari was excellent. We had a great dinner! Highly recommend! Everything was fabulous. the dishes were fresh and fabulous. Love the veggies puree's used. My go to spot for scallops in AC. 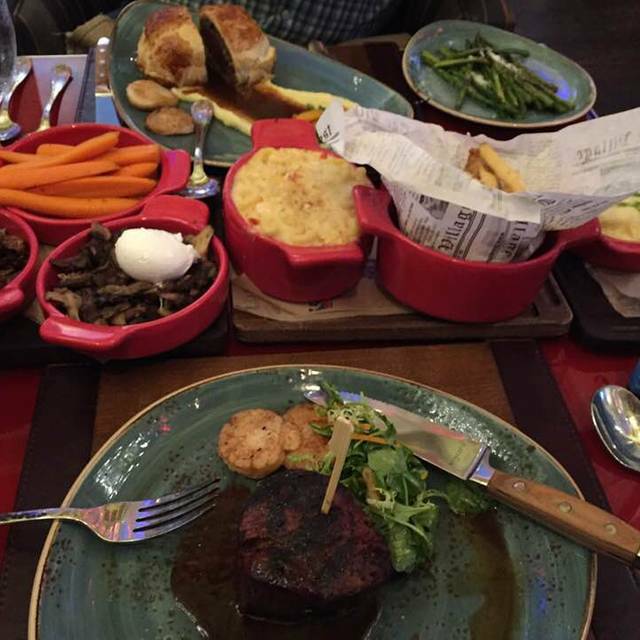 We love eating at Gordon Ramsay Pub the food is delicious especially the brussel sprouts. The food was amazing. The service was top notch and I think the price was extremely reasonable. I highly recommend this restaurant and I would and will definitely return. The corner we sat in was quite dark. Difficult to read the menus. Otherwise perfect! The food is incredible!! My husband loved the lobster Mac ‘n cheese and my daughter being a vegetarian loved the Impossible burger. For me the duck confit poutine was awesome!! Would definitely recommend!! We had the most incredible time the other night! Dinner consisted of pork belly appetizer, a lovely Pinot Noir paired with my Beef Wellington and Jeff’s sea bass, some after dinner Grande Mariner and desert. While the food was way beyond our expectations, the service and staff was absolutely the best part of this experience. Definitely a must do, if you get near one of Gordon Ramsey’s restaurants! 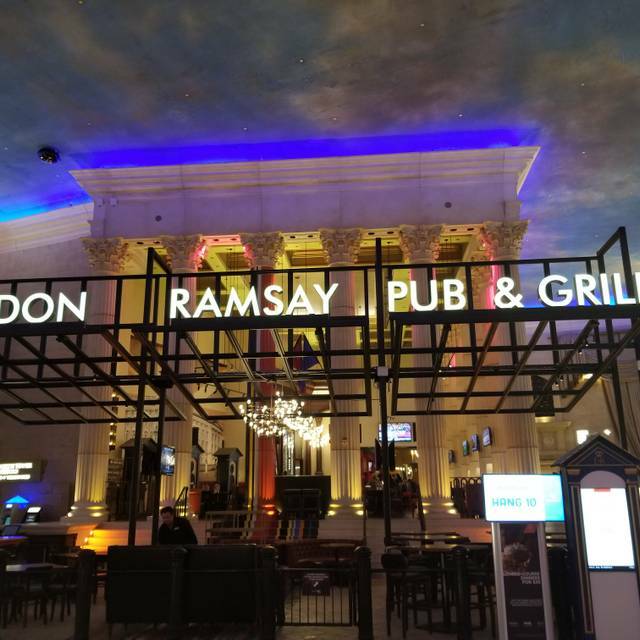 We came to Atlantic City from Virginia Beach Virginia to stay at Caesar’s just to eat at Gordon Ramsey’s pub and grill. I had the beef Wellington and lobster Mac and cheese with truffle fries. Sooo good! Did not like the menu or the service. Very slow even though they were not busy. As well for an upscale restaurant they did not serve bread and butter or salt while you wait. Food took an hour to arrive. THIS IS A HARD CHOICE. THIS IS THE THIRD TIME WE HAVE EATEN HERE. THE FIRST TIME WE WERE NOT IMPRESSED AT ALL AND DECIDED WE WERE NOT COMING BACK. I DON'T REMEMBER WHY AS IT WAS WHEN THEY FIRST OPENED. WE HAD THE OPPORTUNITY TO DINE HERE ABOUT 6 WEEKS AGO AND HAD A WONDERFUL MEAL AND GOOD SERVICE. IT WAS BACK ON OUR LIST! THIS PAST SATURDAY NIGHT WE HAD RESERVATIONS AND ARRIVED 20 MINUTES EARLY AND WAS SEATED IMMEDIATELY. IT WAS BUSY BUT THERE WERE PLENTY OF VACANT TABLES. WE PLACED OUR ORDER AND WAITED OVER 40 MINUTES FOR A CAESAR SALAD TO ARRIVE. IT WAS A JOKE. LOOKED LIKE SOMEONE PULLED THE STUMP END OF A HEAD OF ROMAINE LETTUCE OUT OF THE GARBAGE, POURED DRESSING ON IT, AND TOPPED IT WITH AN ANCHOVY. THEY SERVED THE "CORE" ONLY. THERE WAS NOT ONE EDIBLE LEAF ON THE PLATE. IT WAS DISGUSTING. WAITRESS OFFERED TO BRING US A NEW ONE BUT WE DECLINED. WAITED AN ADDITIONAL 20 MINUTES FOR OUR MAIN COURSES WHICH WERE NICELY PRESENTED AND WERE VERY GOOD. THE MANAGER STOPPED BY AND ASKED IF EVERYTHING WAS GOOD. WE TOLD HIM ABOUT THE SALAD AND HE APOLOGIZED AND TOOK IT OFF OUR BILL, IT MIGHT BE QUITE AWHILE BEFORE WE RETURN. CAN'T UNDERSTAND HOW GARBAGE WAS ALLOWED OUT OF THE KITCHEN AND SERVED TO A CUSTOMER. Food was excellent the server was very pleasant but service was slow. Also very noisy. We arrived at 12:30 and asked if we could add on one more. Host & manager were very accommodating. Food was great. Only issue was the service. It wasn't busy and we had to wait awhile. Amazing. Janine was the best and very knowledgeable and kind and welcoming. The food was amazing. Overall a quality meal but overpriced. 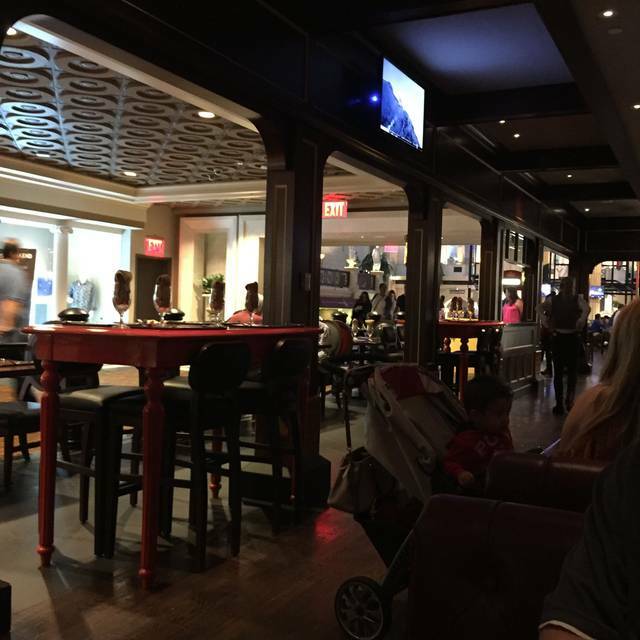 Gordon Ramsay’s Pub and Grille located within Caesar’s AC was an enjoyable experience. My fiancée and I went there for our 2 year anniversary and while definitely overpriced nevertheless provided a quality dining experience. The seating is mostly open and right on the main concourse of the hotel so you will see a lot of people walking back and forth. This can provide definite entertainment value. Service was good. They definitely don’t rush you. They will take your order after each course so it’s not as if you will order your appetizer and meal all at once. Drinks are quite pricey, about $8 for a pint of beer. Mixed drinks were about double that. Appetizers are in the $15-$20 ballpark. For the main course my fiancée had the fish and chips. The meal was good. Fish done well and good wedge chips included. Again, it’s fish and chips so the $30 plus price tag was a bit much. I had the Seafood pot pie and I have to say it was one of the best meals I’ve ever had. Price tag again was quite high but it was a top notch dish. Generous portions of scallops, lobster and flounder. Lobster Mac and Cheese while quite good was not the best I’ve tasted. 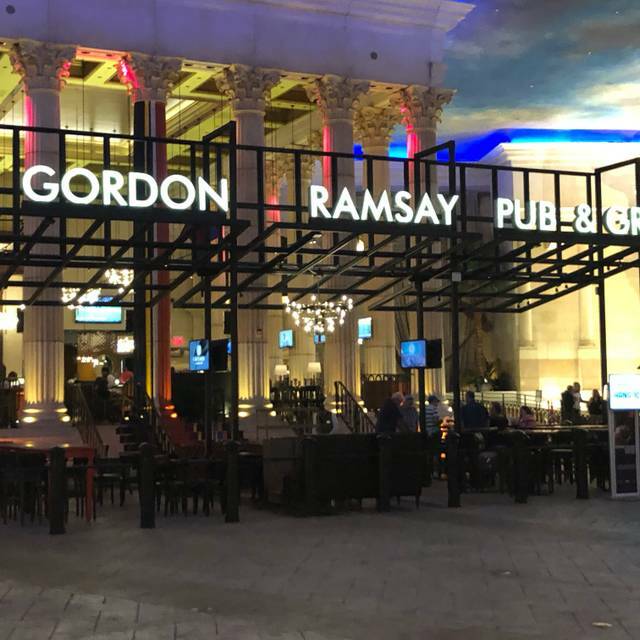 Overall, you will spend $125-$150 for a meal for two, that’s basically pub food with Gordon Ramsay’s name attached to it. Don’t get me wrong it was a quality meal, just quality pub food. Being from the area we are quite used to high prices for everything but even by those standards this place was a bit too much. Great service, food & drinks. Environment could be better. Felt like we were sitting in a mall food court. Inside booths better than tables along the railing.